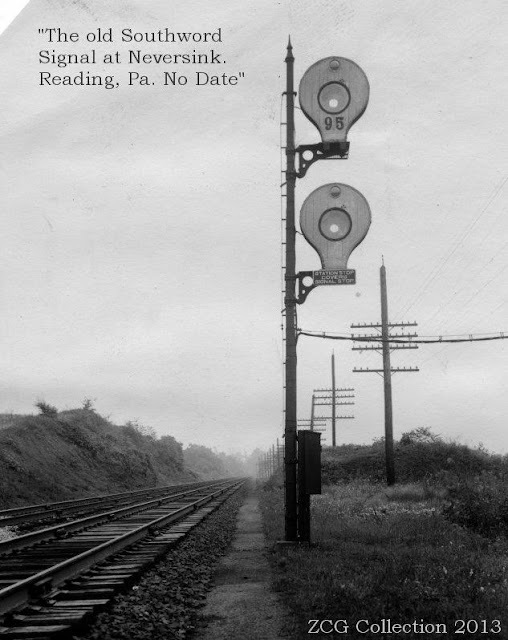 If a book on North American signaling has a chapter before semaphores that covers stuff like, flag signals, ball signals and tilting targets, Hall "Banjo" signals are often included since they not only look strange, but have also been extinct in the wild since the 1950's. While hardly forgotten to history, most sources tend to focus on how these signals worked mechanically, as opposed to how they were employed functionally. The result is that unless one really digs, you are unlikely to know much more about a Hall banjo signal than it was sort of like a searchlight and sort of like a semaphore. Today I hope to clear up some of the ambiguity surrounding these dinosaurs of North American signaling. First, how do Banjo signals work? 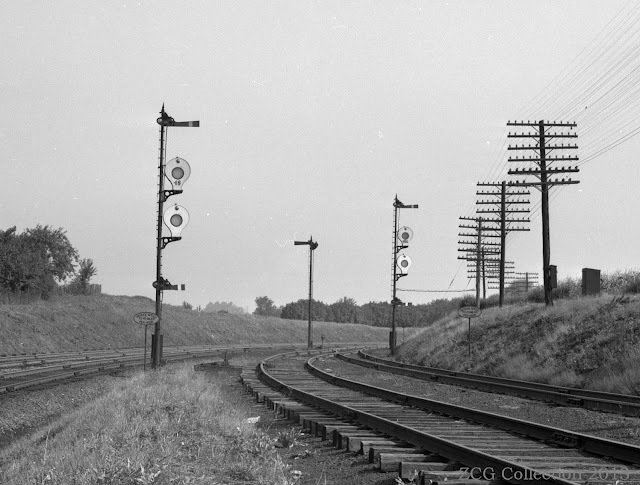 Hall disc signals were one of the first types to work in conjunction with the revolutionary idea of the track circuit. Now I have seen some sources associate Banjo signals with time separation systems, and while they could certainly be used in such a capacity, I am going to focus on their use in automatic blocks. 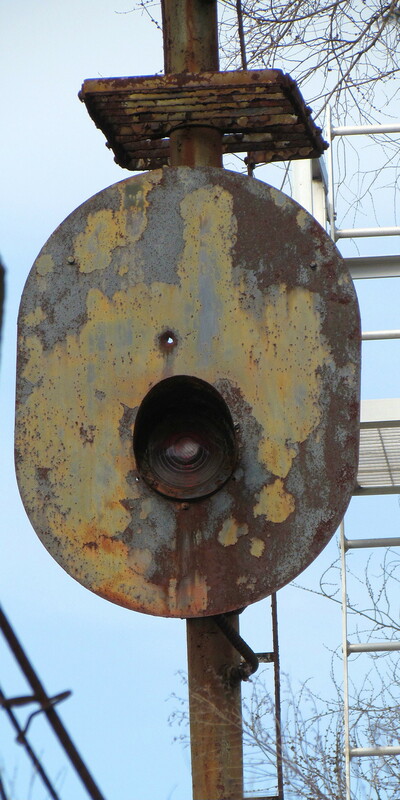 A disc signal (patented ~1869) is basically a searchlight mixed with a semaphore, before the advent of either electric lighting or electric motors. 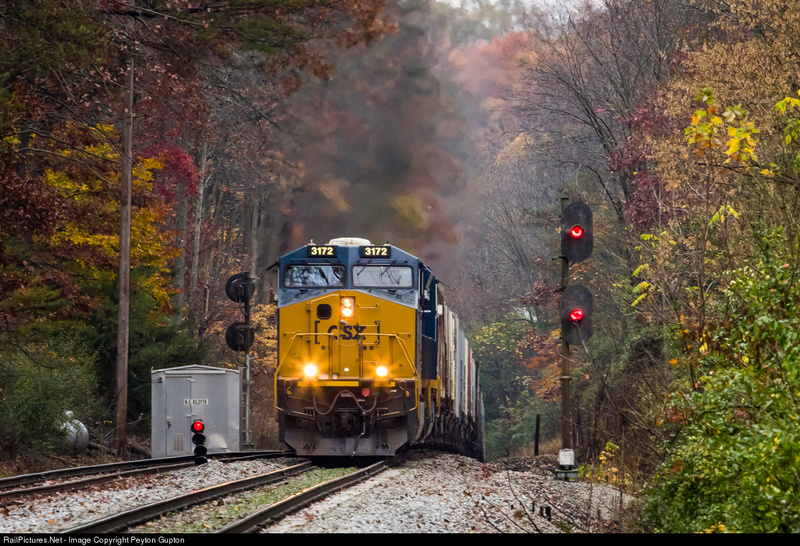 Like semaphores, disc signals have a large day indication (the disc) illuminated by natural light, and a small night indication illuminated by an oil lantern. Like a searchlight, there is a magnetic armature that moves in response to an electric current. When the signal is energized the disc and filter are moved away from the day and night signals changing them from red (or yellow) to clear (or green). If you can't tell where the disc goes, it is moved up to the 10 o'clock position where a small corner can still be observed. Some say this is where the term "Clear" signal came from. Argue in the comments. The above photo shows a pair of banjo signals in their "clear" state, the colored disc moved up and out of the way to allow daylight to show through. 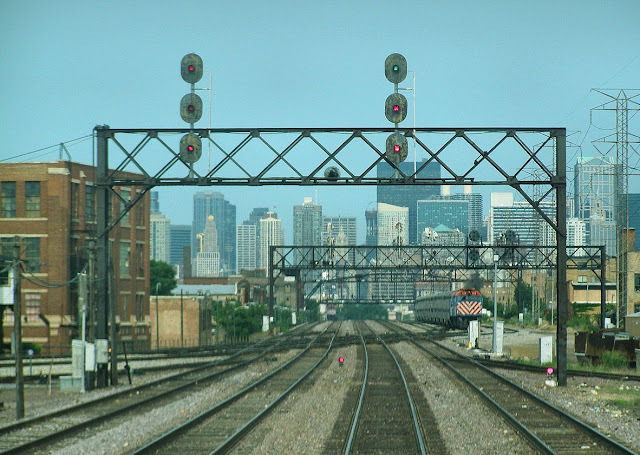 The two state disc signals could be made to display three signal states be using either a distant-home configuration (as is still popular in Europe) or by mounting two heads on the same mast, one displaying Red and Clear, the other Yellow and Clear. Clear/Clear = Clear, Clear/Yellow = Approach and Red/Yellow = Stop (and Proceed). 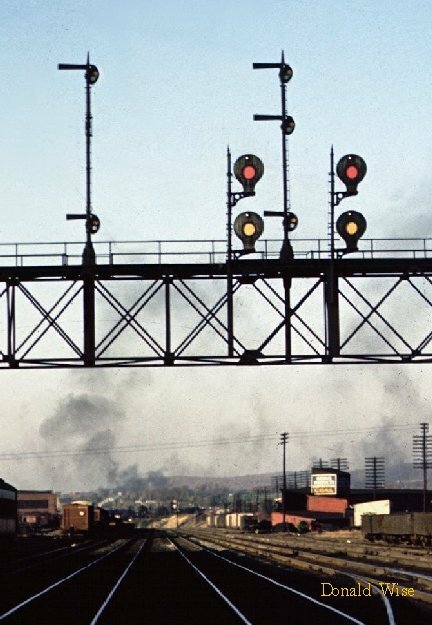 This rare color photo shows a Hall disc signal actually doing its job. As you can see the colored discs are actually pretty effective. In a time before electricity, these would be a high tech alternative to mechanically operated semaphores. This also explains why Banjo signals are so often associated with the Reading system. In the late 19th century the Reading was an extremely wealthy railroad and would be able to afford something that would be like CBTC today. As ABS became more prevalent, disc signals fell into the same category as 2-position lower quadrant semaphores,a commodity technology which lasted into the 21st century on some former Southern Pacific lines. Now it is time to put together the final piece of the puzzle. Above we see an arrangement that was only possible within a fairly narrow sliver of time. Reading Hall disc signals are on the same mast as mechanically operated semaphores. What is going on here? 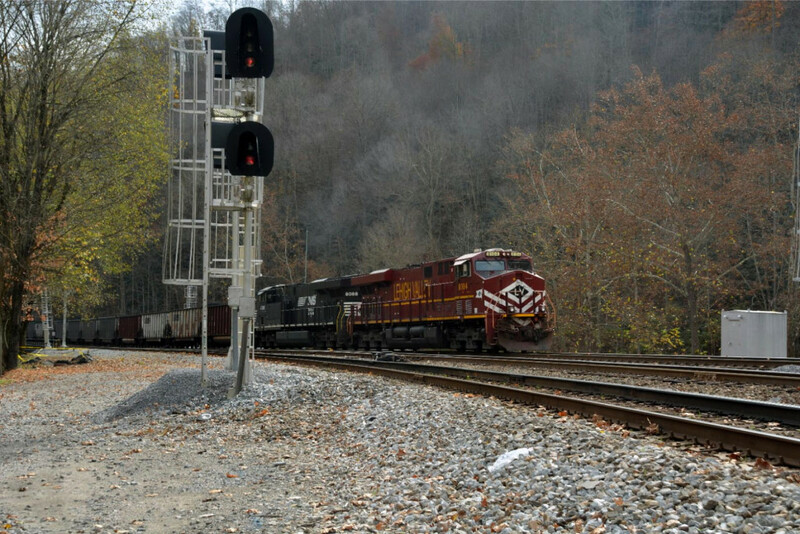 Well the disc signals that are designed to work with low power, primitive track circuits are providing an automatic block signal indication, while the mechanical semaphores are worked from a nearby interlocking tower providing the route protection. This photo might make it a bit more clear. We have a top mounted semaphore showing a straight route, a middle semaphore for a diverging route and then a low mounted call-on signal, all controlled from a mechanical lever frame. 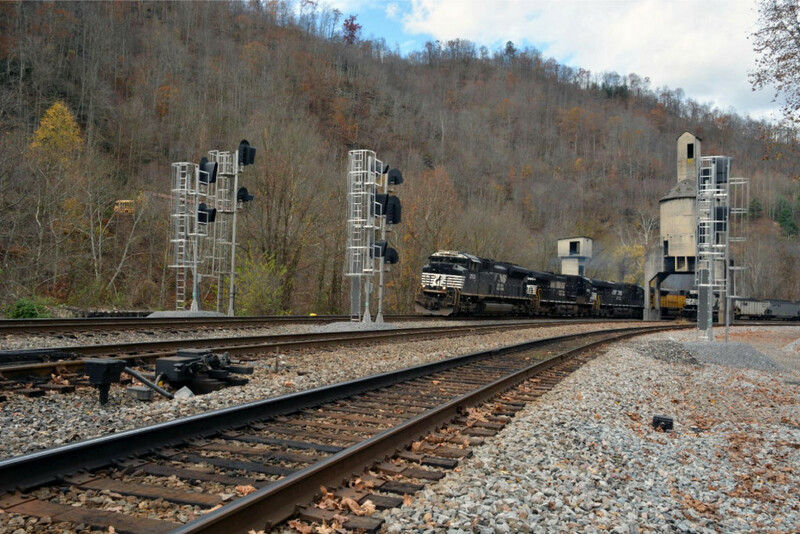 Then we see the Banjo signals acting in conjunction with the controlled semaphores to display ABS indications. In this situation I am not entirely sure why one semaphore mast has two sets of disc signals, but I suspect one is for each of the two possible routes. I am by no means an expert on all the ways these signals were employed, but I do know that one can't simply dismiss them as proto-searchlights or glorified semaphores as is often the case in so many books and museums. Hall disc signals needs to be understood in the context of a manual block world devoid of even the basic electronics that would revolutionize railway signaling in the 1890's. They were cutting edge technology employed by only by those railroads that could afford to be early adopters. Everybody knows that part of what makes a searchlight signal a searchlight signal is the round backing. Be it the large target variety that became the Darth Vader signal of its day or the small target variety that tickled the fancy of the Michigan Central and Conrail, the whole reason the backing plate affixed to signals is called a target is because they are round (with the searchlight at the center). Round round, get around, I get a round. Well some people just have to be different and in the case of searchlights this means the interesting case of the non-round target. Typically associated with the Chicago Northwestern Railway, oval searchlight targets could also be found on certain parts of the CSX system in what I think was the old L&N territory. 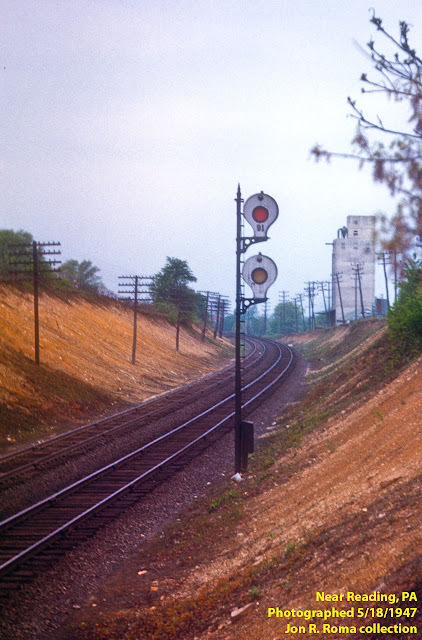 The reason the CNW is known for them is that this style of searchlight appeared at many famous railfaning locations including TOWER A-2 and JB tower in Chicago, in near classic coaling tower in Nelson, IL and at the Rochelle, IL railfan park. The oval searchlights were a US&S product, but don't think that US&S only sold this type of searchlight as they were more than happy to sell the default round backing for their H-2 and H-5 searchlight offerings. As far as I can tell, the oval backings were a modification of the backing for N-2 style color light signals as seen here in their intended function. So why go oval? 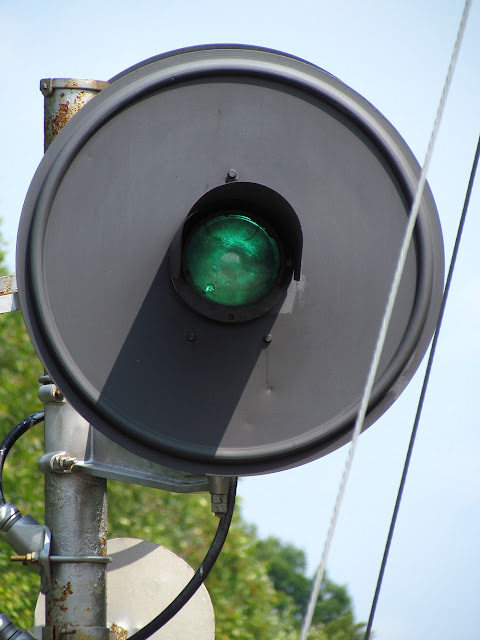 In the case of the CNW, much of their signaling involved (sometimes sideways) GRS color light signals with a mid-sized oval backing and the oval searchlights would provide a similar look and feel. On the L&N their standard signal was the US&S N-series so again, an oval backing would match. This theory is given credence by this photo of searchlights in former C&O territory near Toledo. 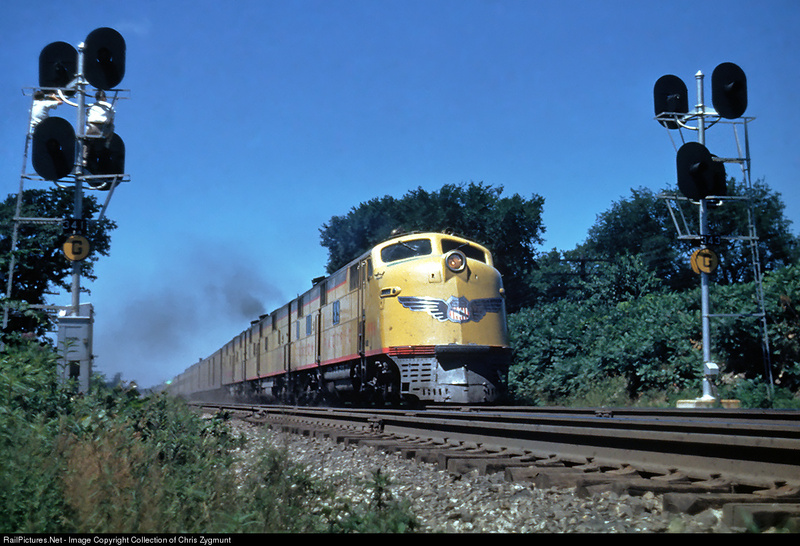 The C&O was almost exclusively a user of US&S N-series color lights. 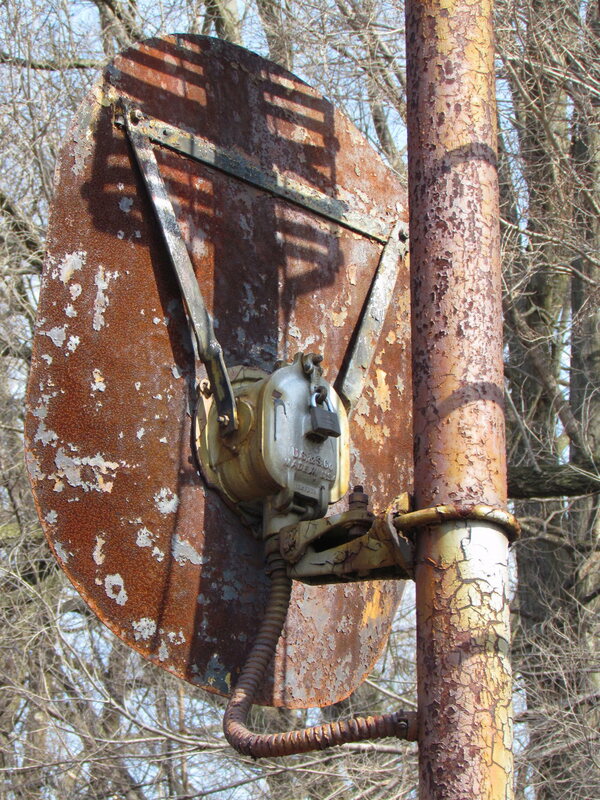 Of course in other situations the oval backing may have been used for clearance or line-of-sight reasons, like this example in the wilds of Tennessee. I can't tell if these are simply chopped down N-2 backings or something with completely different dimensions. I suspect they are simply trimmed down on the sides. I'll leave you with another photo taken in 1955 that shows the CNW didn't save the oval searchlights just for interlockings. 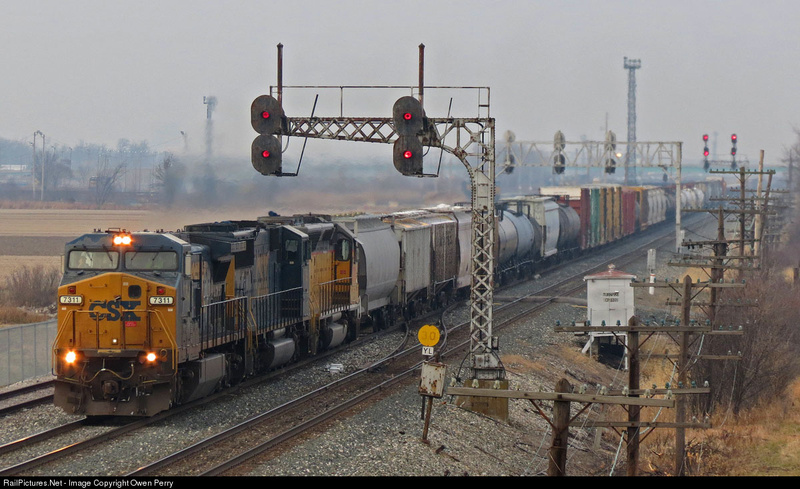 Here we see a UP passenger train rushing past a pair of what look to be brand new CTC signals on the CNW Galena Division between West Chicago and Nelson. All 8 searchlight heads are fitted with oval backing plates. I am uncertain how much CNW territory got these signals and how long they lasted, but it goes to show that oval searchlights can always pop up where you don't expect them.